This week I’d like to speak about skincare. This time with the added element of eczema and how it affects the products I use on my face on a regular basis including makeup itself. Because the struggle is real ladies (and gents). My love of makeup, of all things cosmetic and skincare, is overshadowed by…eczema. And as I sit here writing this piece now, I’m having to constantly reapply cream to my swollen eyelids and will possibly not be able to leave the house today because my skin is so bad. Pretty sh*t day for a gal who likes to blog about beauty and all the products she loves to use eh!? Now. It’s not the end of the world. It’s really not. Eczema is pretty common out there, even for adults. And it’s treatable. And I do treat it. I do my best to keep it at bay making sure I know that what I’m using on my face is gentle enough to not break me out. I’ve spent so long testing and trialing products, taking steps out of my routine to see if they were the cause. But sometimes you just never know what’s going to happen – life is unpredictable and so is my skin. I used to suffer with eczema quite bad in all my joints when I was about 4 or 5. And it itched like hell. And I never used to like going in the sea on holiday because it would sting so much. NOTE: It’s funny what you remember about childhood and that seems to be a huge light bulb moment for me. Maybe that’s why I’m not really a fan of the sea still to this day. Hmmmm. However, ever so recently, I’d say from July of last year, I’ve begun to suffer with the same itchiness (even the word itchy makes you want to itch!) that I received as a child but this time it has appeared in a more unusual and prominent area – my face. Now, as far as the story goes, my mum always used to comment (and still does) on how baby soft my skin has been since I was young and I used to bask in the glory – I’ve never had any real problems with breakouts or acne, just the odd usual spot when I was due on or I’d eaten a lot of bad food or perhaps drank too much on the weekend. My skin on the rest of my body in general was always in good condition so for me to start having to deal with the itchiness, the redness, the lumps, the dryness, the bruises from where I’ve scratched too hard to relieve myself, it really did start to get me down. The areas on my body which are most affected by eczema at this point have been the crease in my right arm, (just the right arm for some bizarre reason??!) the backs of my legs in my knee joints, my upper leg area close to my bum if not on my bum sometimes (it gets personal), my fingers and knuckles, my jawline and my eyes. It’s a real struggle. Anything perfumed, that’s out the question. I crave to see the words ‘sensitive’ ‘for dry skin’ ‘aloe vera,’ because for me, it’s a sign that my skin will have a little bit of respite from the constant flakiness and redness that it goes through most days. Another disclaimer!! Most of these products aren’t especially designed for eczema as such, however I do own some prescribed/over the counter creams but the majority of the time, it’s just about trying to get as much moisture back into your skin as humanely possible. I try to use an eye cream in my daily skincare routine. The skin underneath our eyes is so thin and fragile that it’s important to take good care of it and I have been known to get dry and flaky skin in those areas (which is a nightmare on days when you just want perfect under eye concealer). Its fragrance free and made with organic carrots, pomegranate and Shea butter so it’s packed with vitamins. Carrots are good for your eyes after all! Sensitive skin. Check. Red skin. Check. Although you don’t/can’t put face masks on your eyelids or around your eye area, face masks like this are great for a little skin pick me up every now and then especially when my skin is acting up and is a bit irritated. It’s so smooth and cold when you apply it it feels amazing. 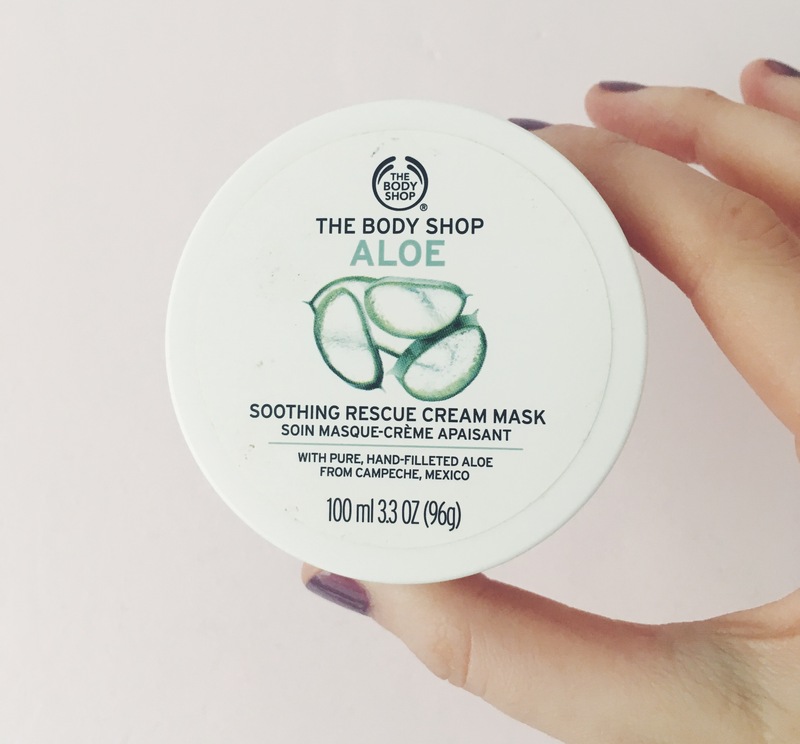 Oatmeal, Aloe Vera and Chamomile extract make up the bases of this face mask which all help inflammation whilst soothing and calming the skin. I normally apply this once a week just to maintain a routine and actually see a difference. Now comes the medicinal part. 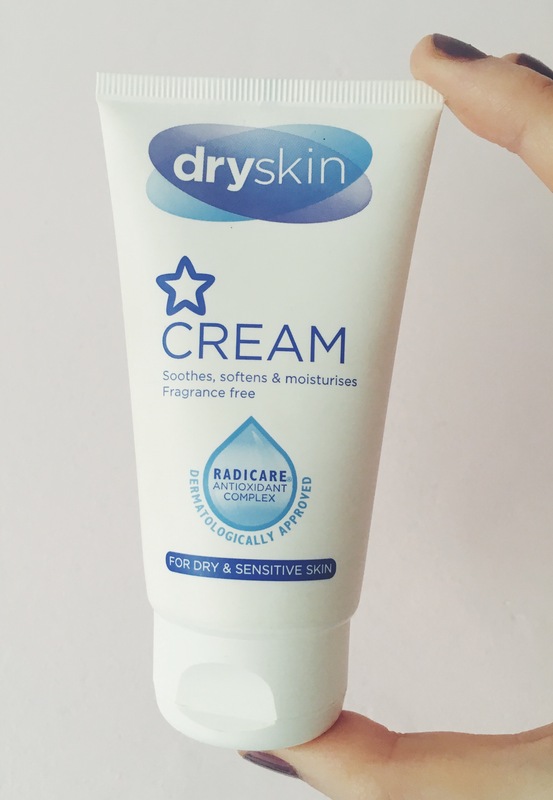 When I first went to the doctor to tell her about my eczema, I thought she would prescribe me the cream of all creams – the holy grail in eczema creams. Instead she wrote down a list of items that I could’ve went out and bought in the time I spent sitting in the waiting room for my appointment. E45, Aveeno – creams high in emollient. I felt stupid because I had previously glazed over them in Boots a week prior to my appointment. (They work amazing by the way) I just didn’t think they would work. However, she did give me a list of steroid creams which would help when I had a really bad ‘breakout.’ The thing with steroid creams are that they are so powerful, you have to use them ever so sparingly and only for short bursts of time as they can thin the skin. They do the job so well – they stop my itchiness and they clear up the scabs and the redness after a few days. However, I’m unable to put these creams on my face because they’re so intense and concentrated. 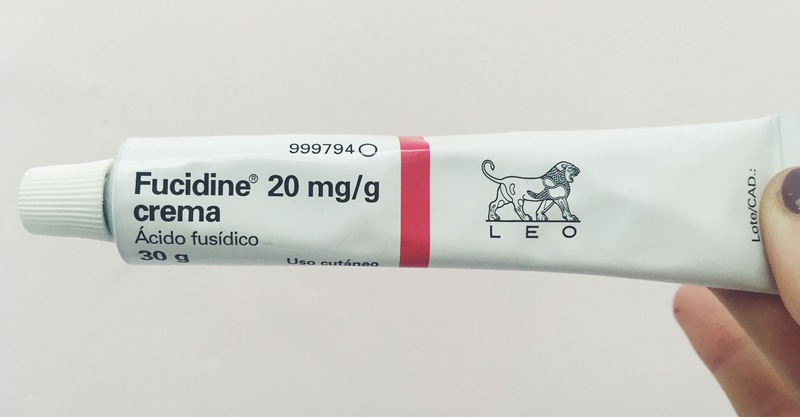 I’ve been recently using Fucidine (below) which is an antibiotic but have also used HC45 and Betnovate steroid creams which are a bit more intense but they all pretty much do the same job. There came a point in my life where I would always use a variety of different scrubs and face washes near enough every morning and night. Then I stopped. And my skin became clear of any spots or breakouts. The important thing to learn is not to ‘over strip’ your skin of all its natural oils – you have to let it breathe! All the scrubs I was using with all the micro beads were just too abrasive for my skin but I thought I was doing it the world of good – until the next day when I’d discover a spot bursting through. 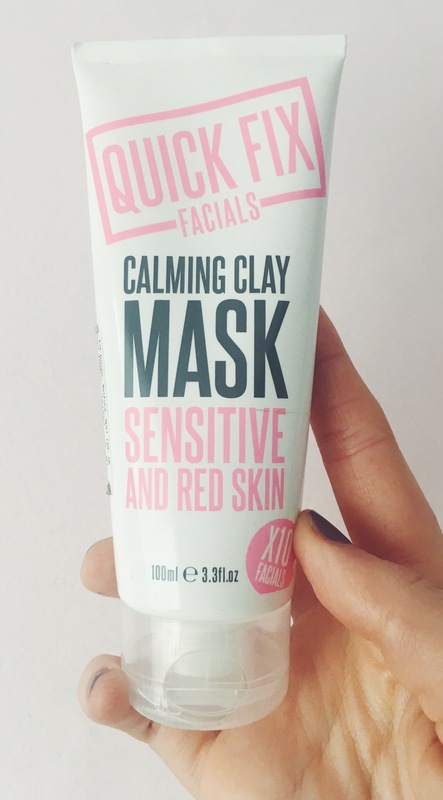 Now the only face wash in my routine is this pure clay detox ‘wash.’ It’s amazing. It contains NO soap and NO micro beads, just 3 types of clay and charcoal which comes out as a gel formula and turns into a foam. It’s non abrasive and my skin feels so soft and extra clean afterwards. Its so gentle and perfect for skin like mine that gets irritated. I have to say I have been blown away by this product. It cost me about £2.50 from Superdrug and for ‘own brand’ it is pretty amazing. Before I bought this moisturiser, I used to swear by the Body Shop Aloe Day Cream but would never seem to reduce my flaky eyelids. Once again, fragrance free is a big factor for anyone who deals with red and sensitive skin as some moisturisers can sting my face so badly that I have to quickly splash myself with cold water immediately. It’s not glamorous. A little goes a long way with the cream, it’s pretty thick but surprisingly non greasy and has really helped my eye area, especially for when I want to apply eye shadows. It can be used on your body and hands as well. A great little 3 in 1 product. I love a bargain too. 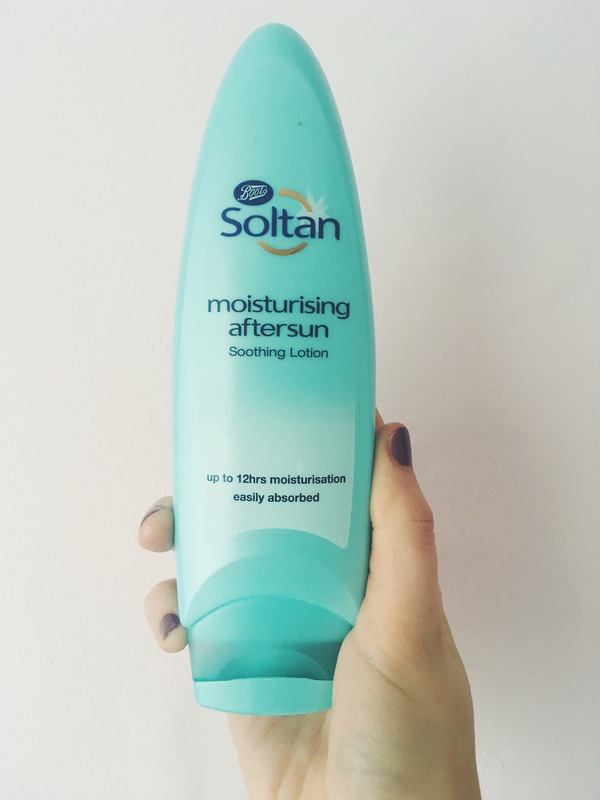 I’ve mentioned after sun as my go-to body moisturiser for all year round previously in my ‘October Favourites’. Check it out here. I use after sun as opposed to any normal body moisturiser because of how quick it dries into the skin as I am bloody impatient. There’s nothing worse than getting out the shower, moisturising and then having to wait till you’re dry enough to then attempt skinny jeans. 9 times out of 10 I just end up skipping the moisturiser part and that can be dangerous these days. Not anymore. I know I’m receiving intense, non-greasy moisturisation all within seconds and can be fully dressed and out the door without a care in the world. It’s changed my world. This product was mentioned in my first ever blog post about skincare back in August . And to this day I still use this without fail once or twice a week before bed. It’s so soothing for my face so I literally lather it on. This range is all about products that are fragrance, colourant, preservative and alcohol free and they’re some of the best skincare products I’ve come across so far. This just helps to soothe the slight tight and burning (not as dramatic as it sounds) feeling that I might get from taking my makeup off. 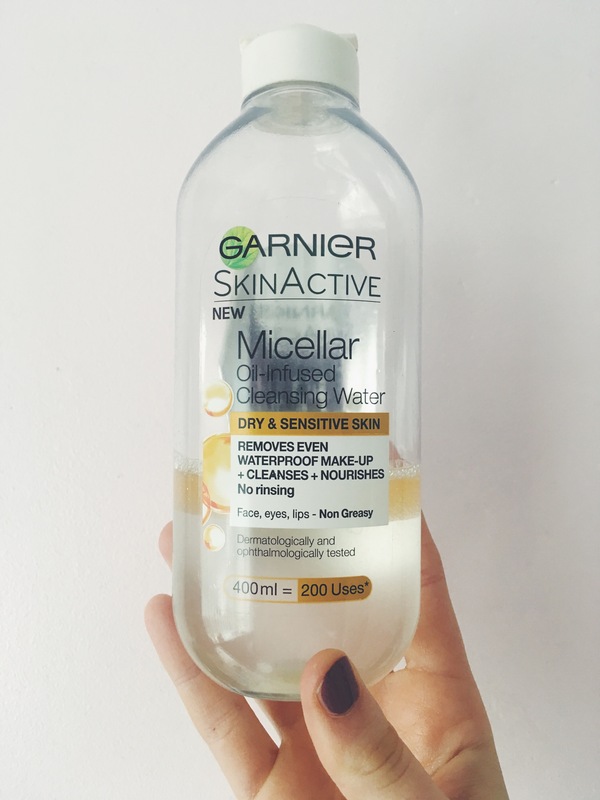 I swear by Micellar water these days. I find makeup wipes to be way too abrasive especially for around my eyes and especially when I’m having a bad flare up day. Even with the oil mixed in, it’s still such a lightweight, gentle solution and feels like you’re just wiping your makeup off with water. The oil nourishes the dry areas on my skin and I’m just so happy that I don’t have to rub at my skin anymore. It really does make the world of difference. Once again, this was such a long post but thank you so much if you got to the end! Bloody hell, I wish it was this easy to have written 2000 word essays in Uni as it has been for me today! I just wanted to write this piece to let everyone know what I deal with on a regular basis even though I regularly post about makeup and beauty! I love makeup and beauty and skincare and my ongoing battle with eczema doesn’t change this! Interesting read I’ll have to try and few of these products !